Consistently happiness researchers report that being surrounded by loving friends is a top determinant for happiness! Plus good friends are not only good for your mind and spirit – but your body, too! According to a 2010 report in the Journal of Health and Social Behavior, strong friendships have been linked to a boosted immune system and increased longevity! Unfortunately, sometimes life can become so extra chunky busy – that it’s tough to find time to nurture and maintain our friendships. With this in mind, I created a new gift book called Friends Forever (Whatever, Whenever) which is a helpful way to show friends that you appreciate them! This gift book is a gorgeously illustrated celebration of friendship – to give to a good friend to cheer them up – and cheer them onward. Friends Forever (Whatever, Whenever) does not include any specific tips on how to be a good friend. Its mission is to serve as a loving gift to share with friends to let them know you appreciate them! So… I decided to share some helpful tips here on my site – to give you beneficial insights and effective ammo to help you deepen and lengthen your friendships! 7 simple tips for creating deeper friendships – which last a lifetime! Examine your schedule and get honest with yourself. Explore if you can make more time for people. Truth is: Many friendships go downhill because of lack of effort and extra chunky busy-ness. If you’re truly overly-busy, explore how to multi-task meeting up with a friend while doing other things on your “to do list” – like going to the gym, spin class, pedicures, hair appointments – even grocery shopping! Be realistic about your friends’ schedules and personal responsibilities. If they’re busy a lot – empathize with their overwhelm. Don’t guilt-trip people. Conversely, if they’re not busy – and always reach out first – acknowledge their loving efforts and thank them. Make sure when you do meet up with friend, you share openly and vulnerably – and listen to them with an open mind and full heart. Friendships deepen when there’s lots of shared empathy and shared self-disclosure. Regularly do small acts of kindness to let your friends know you appreciate them. Buy them coffee or lunch. Bring them flowers. Or send them my new book FRIENDS FOREVER (WHATEVER, WHENEVER) to let them know you love and appreciate them! 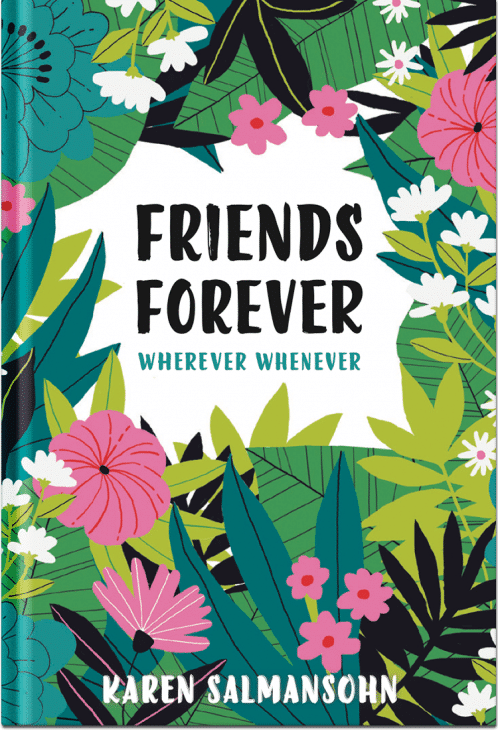 Get a peek inside Karen Salmansohn’s gift book for friends – Friends Forever (Whatever, Whenever) – and read the consistent 5 star reviews!